I have had good success eliminating a migraine prodrome aura. I cured it by using a special eye exercise. The procedure was intended to work the eyes and the visual centers of the brain harder than usual by forcing them to do a cross-eye fusion procedure. The speculation behind the possible success using this method was based upon a reported brain scan done during migraine attacks which showed an abnormal blood flow to the visual cortex located in the back of the brain. These cross-eye procedures force the brains visual centers to do far more work than is usually required of them and that forces the brain to allocate the blood flow in a different way from what they were doing to create the migraine aura. This is an experimental procedure which I performed upon myself. I am only reporting what appeared to work for me and I do not necessarily suggesting that you try the experiment so any results you may have, good, bad or inconclusive are strictly upon your own recognizance. However, below are the cross-eye charts which I used successfully to eliminate my visual hallucinations in about three minutes. Usually it takes about 30 to 50 minutes in a dark room with a hot or cold bag on the back of my head to clear up the aura. I have tried both the hot and cold treatments but found that tapping the back of the head worked better. But this cross-eye treatment worked best of all. What works for me is to look cross-eyed at my finger tip held between the flags about half way to the screen and then to slowly move it towards and away from my face while looking at my finger tip and thinking about the dot. At some point the central dots from the opposite fields fuse into one. When they fuse I slowly lower my finger out of sight while watching the dot. 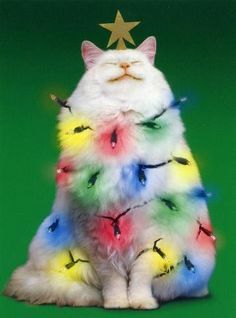 And then in about twenty seconds the light show begins. 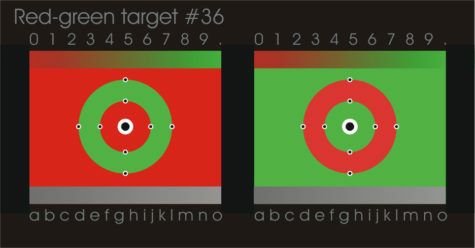 With Red-green target #36 I like to move my stare between the various smaller dots around the center and to slowly read the numbers and letters. If my eyes uncross I return my finger to the position where fusion took place and can usually get the fusion back in a few seconds. 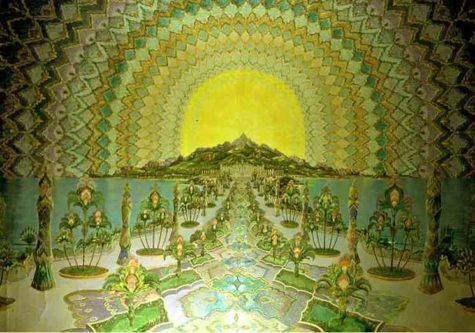 I created these pictures for the cross-eye fusion experiments but I discovered that they confused my visual centers so much that the effort of fusion soon forced my brain to abandon migraine auras and give its attention to the fusion. 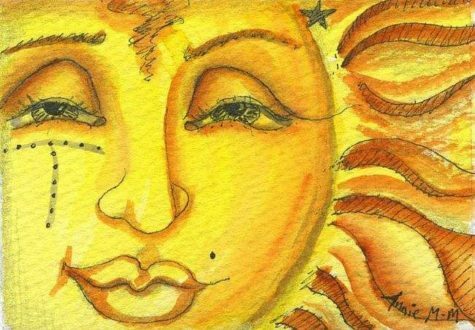 Even under normal non-aura brain functioning these pictures created highly volatile liable images which will shift quickly through a variety of colors and golden blends. For more detail on these cross-eye fusion experiments go to the previous mind fuzing experiments. Here is a group of similar eye experiments with more instructions on how to cross your eyes: Eye Experiments. Please remember these are experiments and you are totally responsible for any strange effects or results. I intended them for learning how your perception works and how it sometimes does very strange and unexpected things. Green is directly related to nature, so you can use it to promote ‘green’ products. Bright, pure yellow is an attention grabber that’s why taxicabs are painted this color. Men usually perceive yellow as a very lighthearted, ‘kiddish’ color, so it is not recommended to use yellow when selling prestigious, expensive products to men – nobody will buy a yellow business suit or a yellow Mercedes. Light yellow tends to disappear into white, so it usually needs a dark color to highlight it. Use it as an accent color to stimulate people to make quick decisions; it is a perfect color for ‘Buy Now’ or ‘Click Here’ buttons on Internet banners and websites. Red keeps us rooted in the red energy of our planet. People who become detached or divorced from the planet tend to be those who abuse it. These people often display some of the negative qualities that are associated with red – selfishness and an interest only in personal, rather than global, survival and short-term security. 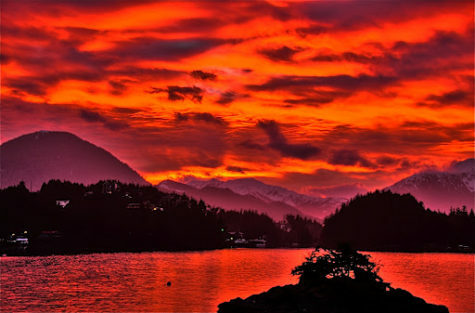 To be healthy in a long term sense, we need the color red to reconnect ourselves to the planet and support it as it supports us. For our personal development, the role involves taking responsibility for our own well being and survival as part of humanity as a whole, not being separate from it. Although often seen as a “green” issue, global and local conservation is also about survival, which is a red issue. Red and green issues are intrinsically linked as they are complementary colors. Phrases like “red light district” and “scarlet woman” aptly describe the sexual nature of red. Some aspects of red behavior are not socially acceptable. Red together with black is associated with evil, for example in the archetypal “red devil” of medieval artists. Blatant expression of emotion is not always easy to handle, whether it is sexuality, passion, anger or aggression. When expressing red emotions, the heart beats faster, the capillaries dilate and the skin becomes flushed and feels warm. Red is thought of as an immediate color. This affects the thinking processes, causing restlessness and impatience. Red can result in very selfish behavior, a focus on personal needs and survival above everything else. Sometimes the drive to survive is what fuels impulsive actions and rash comments. When these traits are managed well they create capable business people who are innovators and entrepreneurs, preferring to move from one project to another, getting an operation on its feet then moving on. They are gifted with being able to manifest new ideas. Often people with red traits are also renowned for their daring exploits, and they can be somewhat extroverted and boastful about their skills. Red brings focus to the physicality of life, to the process of living. The color is symbolic of what we need to survive. Life should be grabbed and lived with a sense of immediacy. 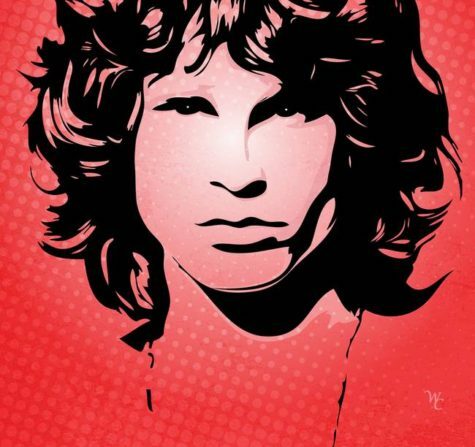 Without red we become listless and out of touch with reality and we fail to live our dreams in this world. Without the foundation that red gives us we just daydream of escaping into fantasy worlds. Is your mind drawing a blank? That’s because, even though those colors exist, you’ve probably never seen them. Red-green and yellow-blue are the so-called “forbidden colors.” Composed of pairs of hues whose light frequencies automatically cancel each other out in the human eye, they’re supposed to be impossible to see simultaneously. The limitation results from the way we perceive color in the first place. Cells in the retina called “opponent neurons” fire when stimulated by incoming red light, and this flurry of activity tells the brain we’re looking at something red. Those same opponent neurons are inhibited by green light, and the absence of activity tells the brain we’re seeing green. Similarly, yellow light excites another set of opponent neurons, but blue light damps them. While most colors induce a mixture of effects in both sets of neurons, which our brains can decode to identify the component parts, red light exactly cancels the effect of green light (and yellow exactly cancels blue), so we can never perceive those colors coming from the same place. The color revolution started in 1983, when a startling paper by Hewitt Crane, a leading visual scientist, and his colleague Thomas Piantanida appeared in the journal Science. Titled “On Seeing Reddish Green and Yellowish Blue,” it argued that forbidden colors can be perceived. The researchers had created images in which red and green stripes (and, in separate images, blue and yellow stripes) ran adjacent to each other. They showed the images to dozens of volunteers, using an eye tracker to hold the images fixed relative to the viewers’ eyes. This ensured that light from each color stripe always entered the same retinal cells; for example, some cells always received yellow light, while other cells simultaneously received only blue light. The observers of this unusual visual stimulus reported seeing the borders between the stripes gradually disappear, and the colors seem to flood into each other. Amazingly, the image seemed to override their eyes’ opponency mechanism, and they said they perceived colors they’d never seen before. Crane’s and Piantanida’s paper raised eyebrows in the visual science world, but few people addressed its findings. “It was treated like the crazy old aunt in the attic of vision, the one no one talks about,” said Vince Billock, a vision scientist. 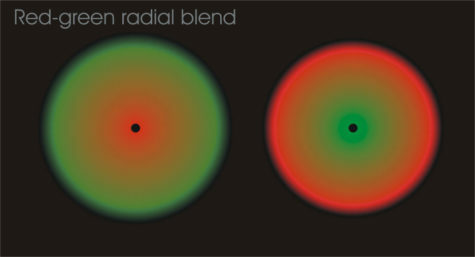 Gradually though, variations of the experiment conducted by Billock and others confirmed the initial findings, suggesting that, if you look for them in just the right way, forbidden colors can be seen. Then, in 2006, Po-Jang Hsieh, then at Dartmouth College, and his colleagues conducted a variation of the 1983 experiment. This time, though, they provided study participants with a color map on a computer screen, and told them to use it to find a match for the color they saw when shown the image of alternating stripes — the color that, in Crane’s and Piantanida’s study, was indescribable. When shown the alternating stripes of red and green, the border between the stripes faded and the colors flowed into each other — an as-yet-unexplained visual process known as “perceptual filling in,” or “image fading.” But when asked to pick out the filled-in color on a color map, study participants had no trouble zeroing in on muddy brown. 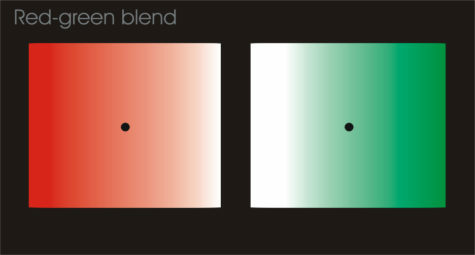 “The results show that their perceived color during color mixing is just an intermediate color,” Hsieh wrote in an email. Fortunately for all those rooting for forbidden colors, these scientists’ careers didn’t end in 2006. Billock, now a National Research Council senior associate at the U.S. Air Force Research Laboratory, has led several experiments over the past decade that he and his colleagues believe prove the existence of forbidden colors. 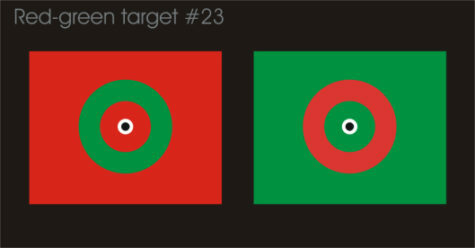 Billock argues that Hsieh’s study failed to generate the colors because it left out a key component of the setup: eye trackers. Hsieh merely had volunteers fix their gaze on striped images; he didn’t use retinal stabilization. The scientists are still trying to identify the exact mechanism that allows people to perceive forbidden colors, but Billock thinks the basic idea is that the colors’ canceling effect is being overridden. 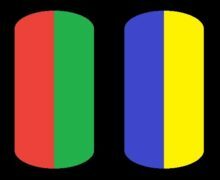 When an image of red and green (or blue and yellow) stripes is stabilized relative to the retina, each opponent neuron only receives one color of light. Imagine two such neurons: one flooded with blue light and another, yellow. “I think what stabilization does (and what [equal brightness] enhances) is to abolish the competitive interaction between the two neurons so that both are free to respond at the same time and the result would be experienced as bluish yellow,” he said. 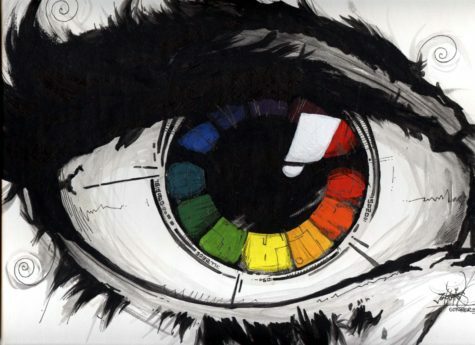 You may never experience such a color in nature, or on the color wheel — a schematic diagram designed to accommodate the colors we normally perceive — but perhaps, someday, someone will invent a handheld forbidden color viewer with a built-in eye tracker. And when you peek in, it will be like seeing purple for the first time. 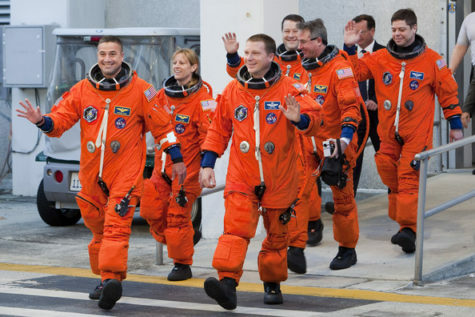 NASA wasn’t trying to make a fashion statement when it picked bright orange for the spacesuits astronauts wear when they launch and land on the space shuttle. In fact, that bright hue called International Orange was chosen for safety, because it stands out so well against a landscape. The same shade of orange coats San Francisco’s Golden Gate Bridge and Japan’s 1,090-foot (333-meter) tall Tokyo Tower. The shuttle ascent and entry suit, called the Advanced Crew Escape Suit (ACES), is a pressurized shell designed to help an astronaut survive if an accident occurred during liftoff or landing. The suit contains a supply of air and water, along with a parachute and survival gear such as radios, flares and medicine. Before the space shuttle, U.S. astronauts wore white or silver suits. And today’s NASA astronauts wear a completely different suit for spacewalks, or extravehicular activities (EVAs). These suits are designed for a different purpose survival in the near-vacuum of space, rather than survival on Earth. Thus EVA suits are white, which reflects the strong heat of the sun and stands out against the black expanse of space. These suits are called Extravehicular Mobility Units (EMUs), and are even bulkier than the ACES. They include temperature control, breathable air and drinkable water, and a tough shell to prevent small pieces of space junk, called micrometeoroids, from harming the astronauts. Russia has its own spacesuits the Sokol suit for launch and landing, and the Orlan suit for spacewalks for those flying aboard Soyuz spacecraft. Both of these suits are white, and function similarly to their U.S. counterparts, with some differences. China the third nation to independently launch humans into space has its own custom-designed spacesuits for spacewalking called Feitian suits, modeled on Orlan suits. Chinese astronauts have worn suits that closely resemble Sokol suits for launch and landing. “The color of the container where food and drink are served can enhance some attributes like taste and aroma,” said study co-author Betina Piqueras-Fiszman, a researcher at the Universitat Politècnica de València in Spain and the University of Oxford in the United Kingdom, in a statement. In general, how people perceive taste is influenced by many factors unrelated to the actual food. Past studies have shown that the color of the plate, the price on a bottle of wine, and the verbal description of food can affect people’s enjoyment of dishes and drinks alike. The participants said the drink was more flavorful when served in a cream- or orange-colored cup. 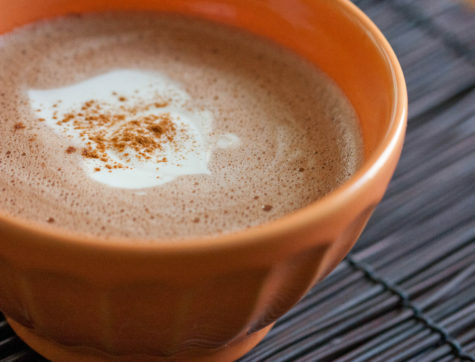 Interestingly, participants rated the orange- and cream-colored cups of cocoa tastier despite the fact that participants didn’t say there were any significant differences in sweetness or aroma between the colored cups. Why is the color red so impressive? The answer lies in our tree-living past. In the back of the vertebrate eyeball are two kinds of cells called rods and cones that respond to light. Cones take in a wide range of light, which means they recognize colors, and they are stimulated best during daylight. Rods respond to a narrower range of light (meaning only white light) but notice that light from far away and at night. Isaac Newton was the first person to hold up a prism and refract white light into a rainbow of colors and realize that their might be variation in what the eye can see. Color comes at us in electromagnetic waves. When the wavelength of light is short we perceive purple or blue. Medium wavelengths of lights tickle the cones in an other way and we think green. Short light wavelengths make those cones stand up and dance as bright spots of yellow, orange and red. Various animals distinguish only parts of that rainbow because their cones respond in different ways. Butterflies, for example, see into the ultraviolet end of the rainbow which allows them to see their own complex markings better than we can. Foxes and owls are basically color blind and it doesn’t matter because they are awake at night when the light spectrum is limited anyway. Humans are lucky enough to be primates, animals with decent color vision, and we can thank monkeys for this special ability. Long ago, primitive primates that resemble today’s lemurs and lorises saw only green and blue, the longer wavelengths of color. But when moneys evolved, around 34 million years ago, their cones became sensitive to even shorter wavelengths of color and they saw red. And what a difference. With red, the forest comes alive. Instead of a blanket of bluish-green leaves, the world is suddenly accented with ripe red, yellow, and orange fruits, and even the leaves look different. For a monkey leaping through the forest canopy, color vision would be an essential advantage. Unripe fruit doesn’t have enough carbs to sustain a hungry primate and they taste really sour. Unripe leaves not only taste bad, they are toxic and indigestible. For the first humans foraging about the forest and savannah around 5 million years ago, it would have been be much more efficient to spot a ripe fruit or tuber than bite into a zillion just to get the right one. And so humans ended up with color vision even though we no longer live in trees. But color is more than wavelengths, more than an indicator of ripeness, to us. Color has become symbolic, meaning it has meaning, and that meaning is highly cultural. Chinese athletes and Chinese brides wear red because red is considered lucky. The U.S. athletes also wear red because that bright color is in the U.S. flag, and because designers of athletic wear, as well as scientists, know that red gets you noticed.